Nothing ever comes without hard work. That’s a lesson I have learned without question this past year. I have never gotten anywhere without hard work and diligence. Even when God created this world he was diligent, patient, and orderly; it didn’t take him an hour or two, not a day or two, but an entire week. When we drifted into sin, He was patient and constantly worked on our hearts for 4,000 years until Christ finally came. When Christ arose, he is still patient and is still waiting upon us everyday for our hearts to submit to him. When I was a little child, I always remember wanting to build something and if it didn’t work out in five minutes, I smashed it and screamed because patience is not natural and I was definitely not born with it. Just like we don’t have to learn the word “no”, we don’t have to learn impatience. It comes naturally because we are all born with sin in our nature. My little brother John is learning how to set the table and sometimes things don’t always work out when a place-mat doesn’t align itself perfectly. All things come with patience, diligence, order and prayer. Physical, mental, and spiritual problems are solved with those four things. I must be honest with you, me and my sister haven’t been grooving too well together lately. Without Christ, we try to be “nice” to each other and it just doesn’t work because we do it on our own and we don’t work with the elements Christ gives us – not to mention the most powerful weapon: prayer (if you haven’t yet, GO SEE WAR ROOM! It was life-changing). When we want problems just to solve instantly without any act, we are so wrong! If that’s true, why do we need prayer? We have been given prayer to fight for our problems and mend them in Christ’s name! Everything takes time and when we expect our personal issues to mend in the blink of an eye, I’ll say it again: we are so wrong! The quote that I posted up at the top was, I thought, pretty profound. The Roman Empire was immoral, filthy, and gross, but they were also hard working and diligent. The only reason they became as large as they were (1.062 million square miles) was because they fought and never gave up (if you haven’t yet, watch Gladiator…it’s epic 😀 ). We are in a spiritual war as believers, and sometimes battles take a day, a week, a month, or even a year. Nothing that is accomplished never is easy. Beethoven worked so hard for so long to compose the Missa Solemnis and Symphony #9 (not to mention he was deaf when he composed them! ), Christ experienced hell for three days when he kicked Satan’s butte and gave the world the ultimate gift, 18 year old Reed Kessler and her horse Cylana didn’t get to the Olympics after one show jumping lesson, and Einstein definitely didn’t discover e=mc squared (i can’t make the tiny two for squared on the top, sorry dude. 😀 ) after one try. Also, last one, but it’s big: my mother was pregnant for 36 months total with all of us four little whippersnappers – now that’s a record! Love you, Mom! Be anxious for nothing, but in everything by prayer and supplication with thanksgiving let your requests be made known to God. Do not be anxious about anything, but in everything, by prayer and petition, with thanksgiving, present your requests to God. Until we meet again dear readers! Be encouraged. P.S. 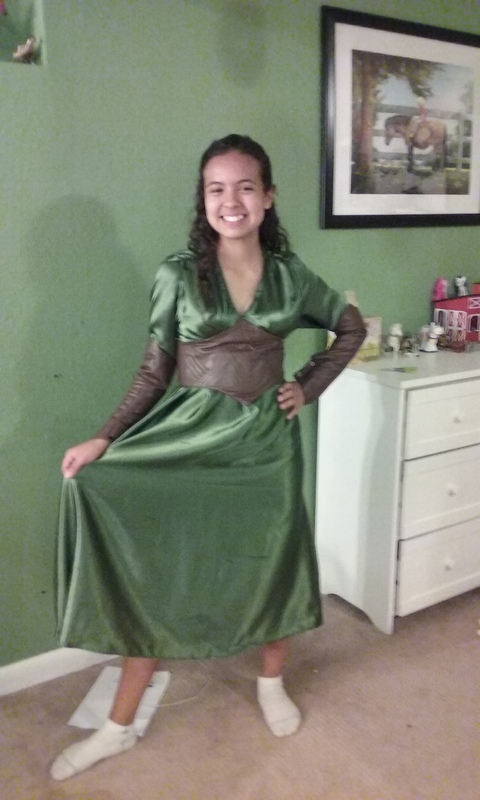 Here’s the status on my Tauriel cosplay…I finished the dress…now I’m going to use some of my savings for accessories (elf ears, Tauriel’s necklace, etc. ).